We intend to use this page as a starting point for anyone interested in the details about the Daniel Road Complex project underway in Rutherford County NC. We will add more information as we discover it so that it is all organized and accessible in a single location. NOTE: We strongly encourage you to review the Rutherford County Budget & Debt document on our site, as it will give you a better idea of how the spending planned on this project will affect the residents of Rutherford county in terms of increased property taxes. 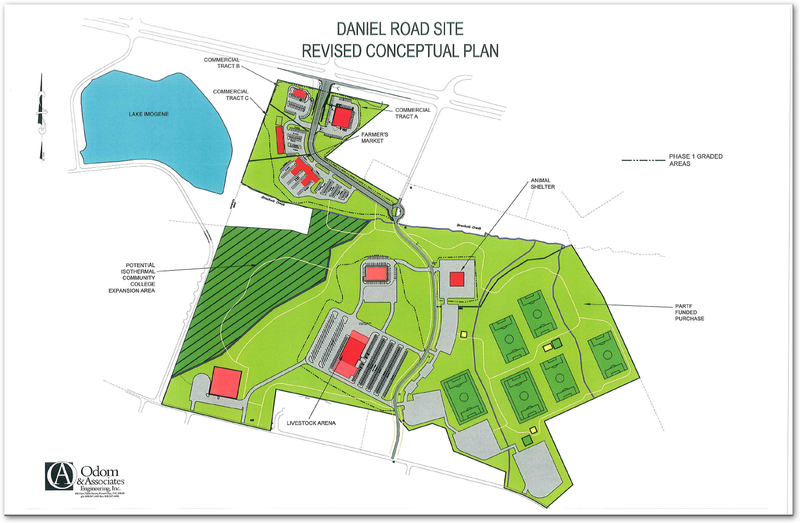 Sometime in mid-December 2009, Rutherford County contacted several county residents informing them that they have been assigned to various committees responsible with planning and reviewing the planning of the Daniel Road Complex. A few of the people on the committees are R912 friends. One of these friends requested a copy of the email that named the committees and its members, as it is public record per North Carolina General Statute Chapter 132. We scanned the email so that you may have access to it, at the following link: Daniel Road Complex Committees Email. This is a list of the committees as they have been defined at this point. We will update this list with details under each committee as we gather more detail about them. This committee will begin its work from a document describing a proposal for an Agriculture Center in Rutherford County. The document can be accessed by clicking here, so please feel free to review it and discuss your findings and ideas based on the information in the document with the members of this board. Please read the document for yourself to find the above information and other interesting facts. Also, take a look at our analysis of the fallacy that a government can do a better job of spending private citizen's money by confiscating it. It should give you a better perspective when reading the promises contained in the Daniel Road Complex documents. Farmers Markets are generally not a revenue generator and typically do not create enough income to be self sustaining. Farmers do not share sales amounts. None of the Farmers Markets identified above could provide any estimated sales volume. At full capacity: 48 stalls (x) $5.00 fee = $240 (x) 28 weeks a season = $6720. More revenue could be generated if additional days are open. This formula is just for Saturdays. Rutherford County Cooperative Extension estimates that there will be shows at the arena on 15‐20 weekends per year. The majority of shows will be local/regional shows for animals such as sheep with an estimated attendance of 250 people. Approximately 75% of the people would be from Rutherford County. The total economic impact of 15 shows using a multiplier of 2 would be $1.7 million per year. 6 full‐size (at least high‐school sized) mixed use athletic fields. Approximately 2 miles of walking trails. Playgrounds, concession, restrooms, parking. The total economic impact of two events is an estimated $1.2 million. A facility of this type will allow travel teams to stay at home and invite competitors in from out of town more often. Quality of life is a major factor, particularly with small business growth, and areas with quality recreational opportunities are in a better position to grow, retain and recruit new business. Many people in the county leave the county to recreate. The Daniel Road Complex should keep more of those people, and their dollars, in the county. The new facility should increase the number of animal adoptions in the county because of its central and visible location, disease control and other factors and thus lead to an increased demand for veterinary services and pet supplies and generate more revenue through adoption fees. The Community Pet Center plans to maintain paid staff for the adoption center. The facility will generate revenue through the crematory. No such facility exists in the county now and would be used by local veterinarians in addition to animal control. The quality of life benefits of the new facility are hard to quantify but will certainly reflect extremely well on the county to have such a facility.